hi - i'm new to this forum since i found a BTVision box in a skip and rather than see it go for scrap thought it would make a nice development platform to play with. Unfortunately its one with no obvious jtag connector - has anyone tracked out the jtag on the rev-c board ? but the JTAG-Enable TCK and TMS seem to be connected down to 0V. there is always the option to connect the jtag from the cpu-top ..
it is definately not an easy task, but several forum users, were able to do it. "JTAG-Enable TCK and TMS are attached to each other beneath the chip and then to ground"
so I don't think that would be possible?? I have here also a box ( KMM 3010-PT )with this processor ( SMP8634LF REV. C ), i tried JTAG but nothing happen, doesn't seem to be working however i was able to get some output with serial port (RS-232). I was wondering if it's possible to do something with this type of hardware ( firmware change ) since these devices are locked to the ISP ? if there is mediaroom running on the box (which is very likely) then you cannot get anywhere with the serial connection. the only option is to patch the bootloader with JTAG during startup. Thanks for the info. , but i found out that there's missing a resistor ( R428 ) in the JTAG_Enable Pin on the box that i have here. 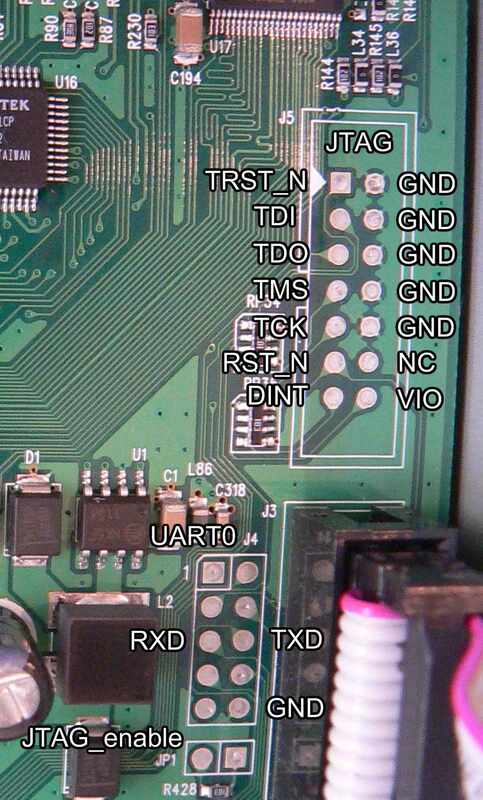 In this picture : http://www.t-hack.com/wiki/images/1/12/Pinout.jpg there's a 10Kohm for the JTAG-enable ( R428 ). I will try again with JTAG and see if i can get any results.